Off the Southern California coast, ranchers are raising “livestock” in federal waters, a possible model for harvesting the world’s oceans and boosting U.S. production. ABOVE THE SAN PEDRO SHELF — The Pacific Ocean is mountain-spring clear here six miles off the coast of Huntington Beach, California, where Phil Cruver has been ranching for a few months now. Dangling between buoys that rise on the occasional swell are sweeps of lines, some strung horizontally, others plunging vertically toward the sea plateau’s floor 150 feet below. The depth drops into oblivion about a mile to the west, and what rises are nutrients that make this prime farming territory. The proof is on the lines — the thick coils of mussel, Cruver’s livestock and his bet that deep-ocean ranching is the future of the world’s food supply. This 100-acre patch of Pacific is the Catalina Sea Ranch, the first commercially viable aquaculture operation in federal waters. The first mussel harvest was this summer, and it is expanding to a planned 30 times its current size. As it does, the ranch will take on the scope that the Trump administration envisions for an industry burdened for decades by a confused bureaucracy and a wary view that using the sea as a solution to future food shortages might do more environmental harm than good. Diving along line No. 38 in the unseasonably warm water, it is easy to see the promise. The clumps of mussels are bulky along the length of the lines, which vanish into cobalt blue about 60 feet down. Schools of small fish swirl around the lines, and tiny scallops grow on the shells of the jet-black mussels. Each line hosts a small world of its own. Nearly five decades ago, Jacques Cousteau urged the world to “plant the sea and herd its animals” as projections for human population forecast that the world would one day run out of food. But the controlled raising and harvesting of shellfish, finfish and seaweed has been slow to develop in the United States, which — despite its long coastlines, once-bountiful fisheries and maritime traditions — imports 90 percent of its seafood. That is changing. A rare common ground inhabited by the Trump administration and the environmental community has made developing offshore sea ranches such as this one off the southern California coast a national priority, though for different reasons. For environmentalists who still have some concerns about the nascent industry, the potential benefit is more far-reaching. Farming and ranching have depleted land and animal species on a broad scale worldwide, and as the global population grows by an estimated 2.4 billion people in the next three decades, the world will need to produce 70 percent more food than it does today. The oceans — covering more than two-thirds of the planet but producing just 2 percent of its food — could be a substitute for terrestrial farming. Small-scale aquaculture operations have been running in state waters for years, mostly along the southeastern U.S. coast, where farms raising shellfish have thrived. Those operations are expanding, if slowly, because operating close to shore can bring farms into conflict with shipping, recreational fishing and water sports. The water quality also is likely to be lower than in the open ocean. 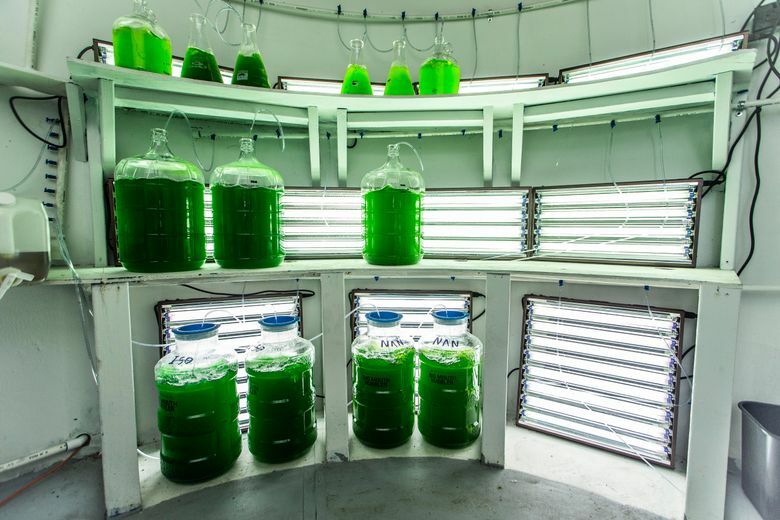 In Maine, lobstermen are exploring whether they can grow kelp, a seaweed with potential as a biofuel, to augment their incomes. Cold-water Alaska, too, is looking at farming kelp, with the goal of becoming what Rubino called the “Saudi Arabia of seaweed.” Hawaiian ranchers are raising yellowtail tuna. But it is often difficult, especially in a heavily regulated state such as California, to pass the necessary environmental tests required to open a sea ranch. California is not issuing any aquaculture permits in state waters, pending the completion of an official environmental review expected in the next year or so. Federal waters, largely off-limits until recently, are the industry’s immediate future. The reason they have not been opened sooner has less to do with concerns about aquaculture as a practice than with a federal bureaucracy that is hesitant to take the lead in regulating a new industry. To operate in navigable federal waters, an operation needs a permit from the Army Corps of Engineers. But a number of other agencies have had a stake in aquaculture regulation, including the Environmental Protection Agency, the Food and Drug Administration and NOAA. Would-be aqua farmers often bounced from one agency to another, racking up costs and frustrating investors. NOAA officials have been working with other federal agencies and aqua farmers to clarify the process. One proposal would have NOAA act as the lead agency in issuing aquaculture permits in coordination with other regulators. Legislation to make that official was introduced in the House and Senate this year, but it is likely to have to be resubmitted to the Congress taking office in January. “The biggest constraint has always been the permitting process, which is exceedingly long and expensive,” said Paul Olin, an aquaculture specialist at the Scripps Institution of Oceanography in La Jolla, California, who adds that the cumbersome system has brought a wait-and-see caution to the industry. Olin has spent his career in aquaculture, developing programs to raise shrimp, scallops and finfish. He is consulting with the California Department of Fish and Wildlife as it prepares the environmental review of aquaculture in state waters. In the meantime, he is looking to the federal oceans as the next possibility. Working with the port of Ventura, about two hours north of here, Olin is helping organize a project in which the port would lease 20 federal parcels of 100 acres each off the coast. The port, bearing the costs of permitting, would then lease the parcels to mussel farmers. The benefit to the farmers is clear. 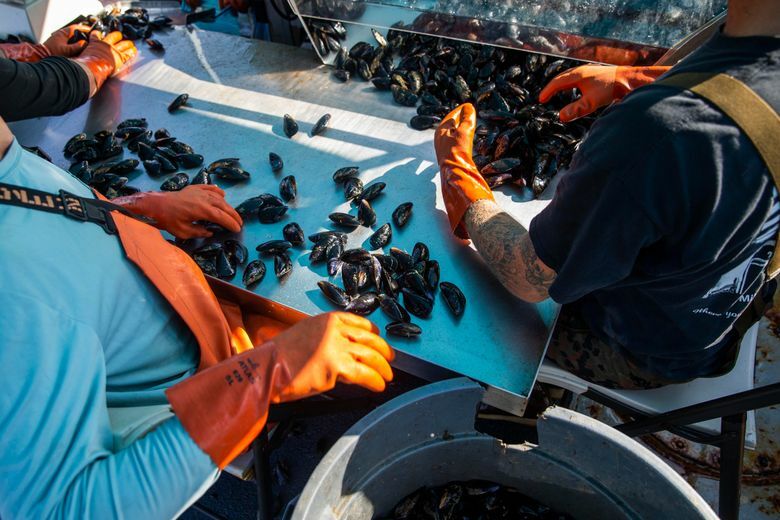 But the port would also gain, Olin said, from the business the mussel farms would bring to a once-thriving working harbor that, like many along the Southern California coast, has been converted largely to tourism uses. 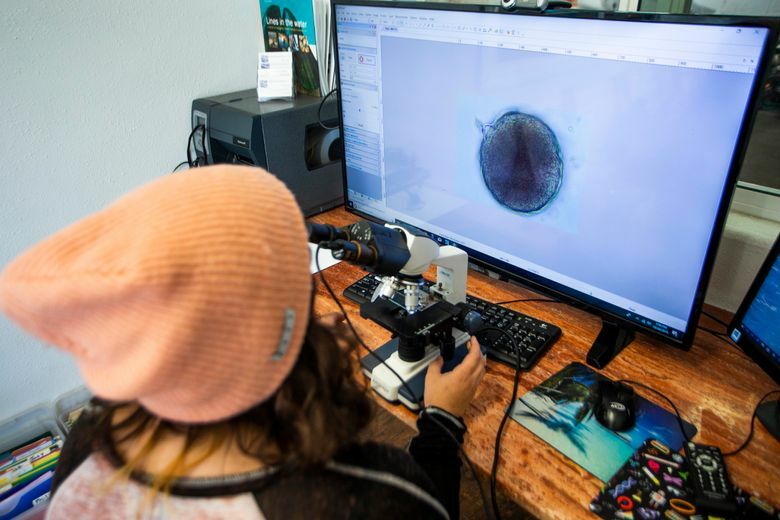 “We’ve seen a major shift in public sentiment — the social license — and government acceptance that this is the only way we’re going to produce the seafood we need,” said Olin, who hopes the Ventura project will be up and running within two years. Most environmental concerns center on the farming of finfish, which Cruver has avoided thus far. The permitting for raising finfish is more rigorous — more federal agencies are involved in regulating and monitoring the activity — and environmentalists worry that feeding the large pens of livestock will severely deplete baitfish populations. 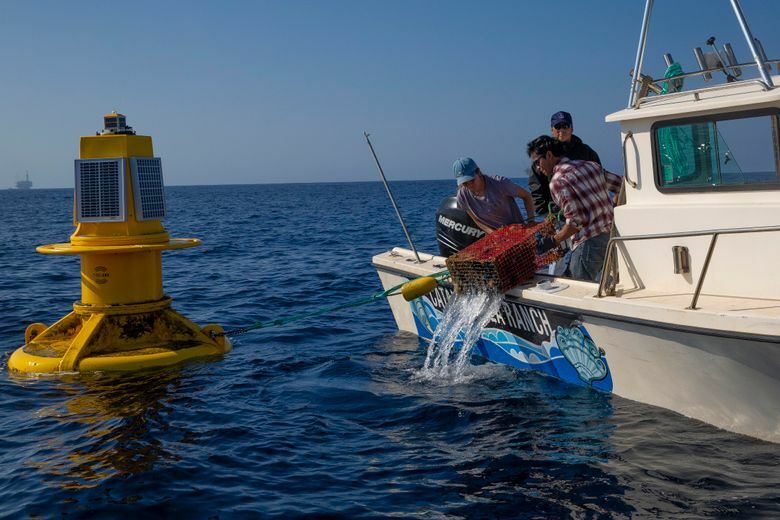 In these operations, commercially profitable fish such as yellowtail and bluefin tuna are raised in large, conical pens that hang from buoys. These species are carnivorous — they eat other fish — so feeding them is a challenge. There are fish-based proteins that can be used as food. But farmers also can use whole mackerel, sardine and other baitfish, raiding one fishery to grow a more lucrative one. There are no finfish aquaculture operations in federal waters. But Don Kent, president of the Hubbs-Sea World Research Institute in San Diego, has been trying to change that. Kent was born and raised in San Diego, and he watched as a once-thriving seaport steadily lost the commercial fishing that had built it. The tuna industry once supported 40,000 jobs along the waterfront, all of them now gone. Four years ago, he began to seek permits to operate a tuna farm four miles off the coast. Occupying less than a quarter-square-mile of surface, the farm would comprise 28 underwater cages. The goal would be to produce 5,000 tons of tuna a year — five times the amount of all the fish, lobster and urchins that come into San Diego today. His initial investors made the cages used on finfish farms. But after two years of waiting for the Obama administration to act, they gave up to concentrate on ranches in Mexico. Kent has found new investors and thinks there is now “a pathway” through the federal bureaucracy that could end in a permit, though that is likely to be at least two years away. “Either we figure out how to do this ourselves or more and more of our seafood will be coming from elsewhere,” Kent said. Everyone in the small aquaculture community knows Cruver, a 73-year-old force of nature, shirtless as he pilots his motorboat around the farm he owns and runs. Cruver has been through the permitting mill, and on this bright fall day, with the hazy mainland on one side, a trio of oil platforms looming in the near distance and Santa Catalina Island beyond, he sounds like a man who has figured it out. He spent $1.5 million getting the ranch up and running, only to see the first trial harvest last year hampered by the lack of nearby federal monitoring laboratories, which meant that the seafood could not be certified as healthy in time to be sold. But after a nearly yearlong delay, that process was smoothed out and profit margins are high enough to make even the wait worth it. With every harvest, something that happens twice a week, a NOAA representative accompanies sea ranch employees to the site, taking samples and sending them to be tested. 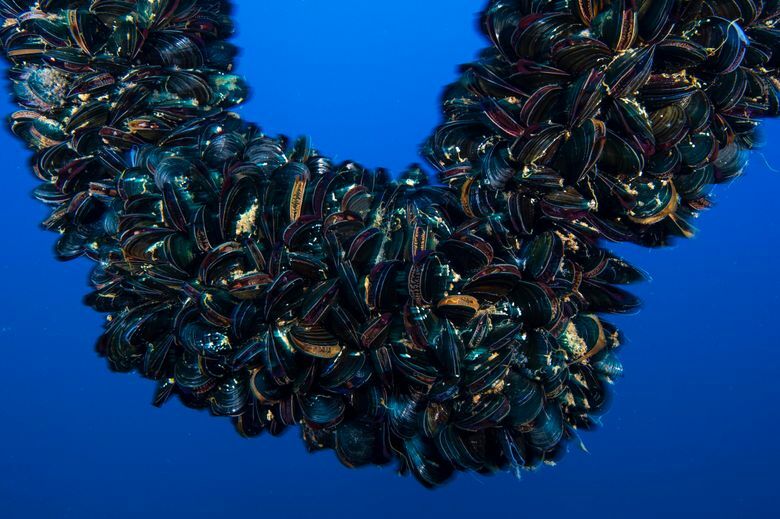 Then the mussels, harvested at a rate of 1,500 pounds a day, can be sold. “How’s it going?” Cruver calls to a pair of recreational fishermen cruising the ranch site, which attracts other wildlife, including the occasional stray juvenile great white shark, that gathers at the edge of the shelf. A third of the ranch will be mussel, a third kelp and a third “cage cultures,” which means scallops, abalone and oysters. Such shellfish and seaweed have a beneficial effect on the ocean, filtering the water and reducing some of the acid in it. The ranch house is a yellow boat with a big winch that cranks in lines from which mussels are plucked by some of the dozen people Cruver employs. Each daily harvest takes hours.